Congratulations! You’ve chosen to say ‘I do’ in one of the world’s most exotic wedding destinations. From an intimate ceremony in the dense Ubud rainforest to a glamourous Nusa Dua beach affair, and everything else in between, we’ve sourced the most romantic places on the island and the venues that will help realise your Bali wedding dreams. Getting married on the southern rim of Bali is all about elegance and extravagance. You can have that luxury wedding that’s sure to leave guests swooning over the spectacular details. Whether you want sand between your toes or would rather a shoes-on affair, most venues along Benoa Bay just north of Nusa Dua offer a choice between beach or chapel setting. Conrad Bali’s iconic water’s edge Infinity Chapel offers the best of both worlds. Glamourous brides will feel at home on the marble walkway of the asymmetrical glass structure, with breathtaking views of the deep blue beyond. The intimate venue seats 60 guests and is elegantly decked in white, with sophisticated floral arrangements (one less thing for you to worry about). Those with a flair for the dramatic can surprise guests with a beach firework and fire dancing display. From elopements to big-scale celebrations, the world is your oyster when it comes to your beach gala guest list if you’re tying the knot at the Grand Mirage Resort. Also located on Benoa Bay, the resort has unrestricted views of the Indian Ocean for you and 300 guests to enjoy over a champagne toast. If you’re after VIP Bali wedding, this is it! If you’ve pictured a sunset as the backdrop for your big day, you’ll need to make your way west to the resort-spangled coast near Seminyak. A wedding photographer’s dream, the Bali Garden Beach Resort lives up to its name with lush tropical gardens growing right down to the Indian Ocean. The friendly staff at this traditional four-star resort take the hard work out of your big day, so you and your groom can count your lucky stars under a bower blooming with fragrant frangipanis. But if a fairy-tale wedding is more your style, you can’t go past Anantara Seminyak Bali Resort where indulgence is the order of the day. Whether it’s rose petals down the sandy aisle or a sophisticated rooftop ceremony, the professional planners will cater to your every desire. The five-star resort is located right on Seminyak beach, making it an excellent sunset wedding venue, with the rolling Indian Ocean waves as the musical score. A pre-wedding dinner gives guests a chance to meet and mingle, making for a more relaxed day ahead. Book the bridal party in for a cooking course at upscale Bumbu Bali Restaurant on Tanjung Benoa and watch them bond over the exotic flavours. If you’re planning to tie the knot in Seminyak, the top chefs at The Amala will share their spicy secrets with you during their Balinese cooking class. If you’re more of a laid back, relaxed bride, then a chilled out coastal do is for you. A short drive north of Seminyak brings you to peaceful waterfront locations. The zen extends all the way from luxurious resorts right down to the temple-lined shore. 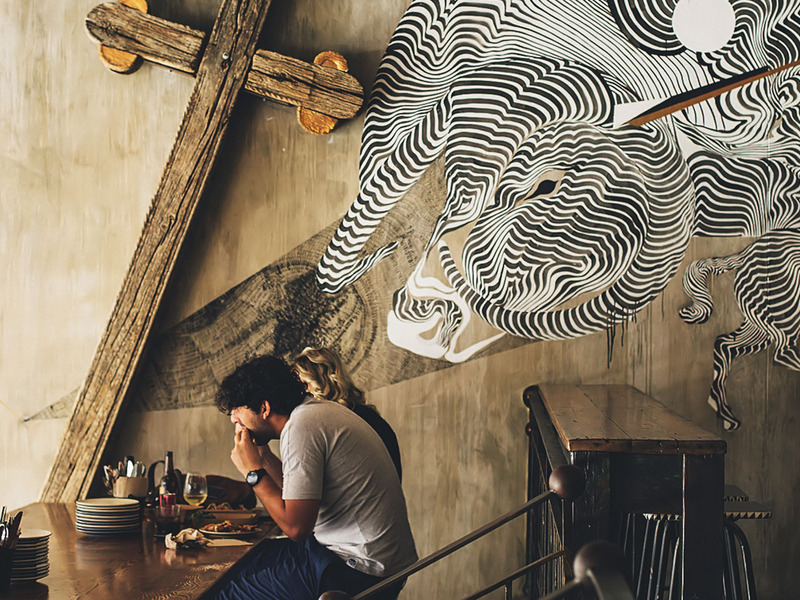 Just 10 kilometres north of Kuta, the coastal village of Canggu is close enough your guests can still make the most of the restaurants, nightlife and activities offered there, but far enough away for a tranquil wedding experience. You will be in raptures from the moment you enter the charming Hotel Tugu, with its rare Indonesian antiques and lush gardens. The eye for detail at this exotic Bali hotel makes it perfect for smaller bespoke weddings, but also fits up to 300 people if you can’t cull your guest list. Leave your guests dancing under red lanterns and fairy lights as you make your way to an opulent villa floating above a lotus pond. Moving slightly further north, keep the golf lovers happy with a wedding amidst the greens and fairways of a world-class 18-hole golf course designed by Greg Norman. Receptions on the Cliff Lawn of the upscale Pan Pacific Nirwana Bali Resort come bedecked in elegant white linens and sparkling silverware. Guests watch your nuptials unfold under the shade of palm trees swaying in the breeze, with views of the Tanah Lot temple. Spend your wedding night basking in the Balinese opulence of the presidential suite, complete with a private terrace, four-poster bed and spa bath. Even the most relaxed wedding comes with its share of nerves. Luckily there’s plenty of pamper packages and yoga classes to suppress those pesky jitters. Grab your stretchy pants and head to Chillhouse, a tropical lifestyle retreat that delivers delicious organic meals, along with surfing, mountain biking, yoga sessions, and a variety of body and soul treatments. For brides who want to keep things simple and spiritual, Ubud’s magical green terraces and mystical mountains offer the perfect setting for the enchanting union of carefree spirits. Walk down the aisle to lilting birdsong and a jungle backdrop strewn with tropical flowers. It’s your very own paradise. The team behind Maya Ubud Resort & Spa are masters of natural romance. Tucked away in the cultural hinterlands of Bali, the jungle views will seduce your audience as you exchange vows on the edge of the river valley. The resort takes care of all your wedding preparation, including wedding dress hire so you can find your zen even before the big day. But for added relaxation, take a class at the yoga pavilion or soak your jitters away in your villa’s private pool. Need a bespoke bridesmaid gift? Organise a day of silversmithing at Chez Monique Jewelry. Not only is this a fun bridal party activity, but you’ll all have a sweet memento of your special day. Creative couples will enjoy creating a bespoke set of silver wedding bands, just as unique as the wedding itself. 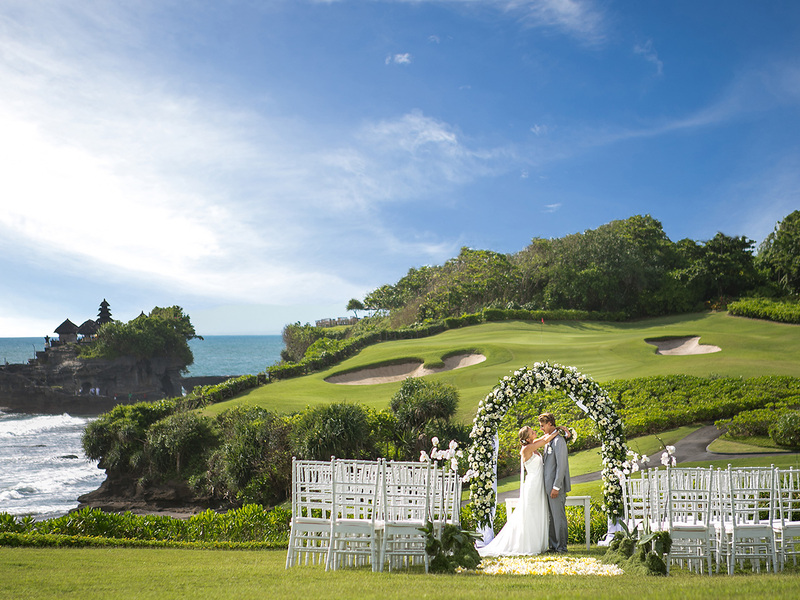 With hundreds of dazzling locations to choose from, Bali is a dream spot to plan a destination wedding. Whether you’re after fairy-tale bling or naturally romantic nuptials, somewhere on the picturesque island your ideal wedding is waiting for you.